During World War II, the Army trained hundreds of thousands of raw recruits and draftees to fill the ranks of the rapidly growing divisions sent to Europe and the Pacific to fight. The training included tough exercise geared towards strengthening the new Soldiers both mentally and physically. The obstacle course was at the center of the training regimen. Obstacle courses ranged from simple wooden structures to complicated, miles-long trails complete with mud pits, barbed wire, and enemy dummies. Courses contained items simulating the numerous objects a Soldier might face in combat. A waist-high wooden beam simulated a bombed-out wall and low barbed wire simulated how close to the ground a trooper had to crawl to stay under enemy machine gun fire. 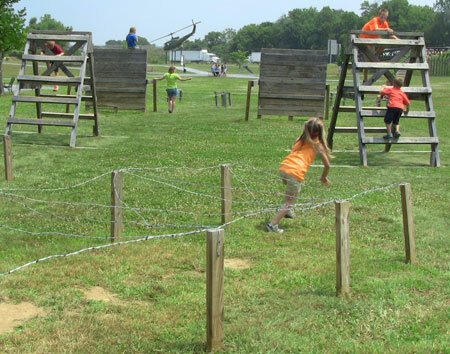 The obstacle course on the Army Heritage Trail is an example of the sorts of items a Soldier might have navigated in basic training during World War II. Children scramble over and under the training course on the Army Heritage Trail. 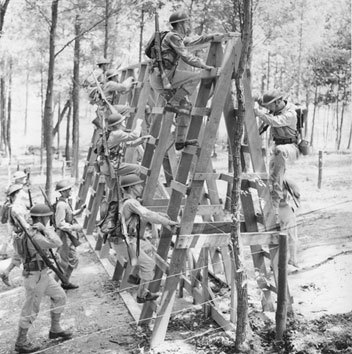 Training Troops to surmount obstacles over steeple chase course, Ft. Belvoir, Va. 1941.